Little Hiawatha (1937), featuring a native American boy, was a cartoon short from Disney's Silly Symphony series. It was very loosely inspired from the American poem 'The Song of Hiawatha' (1855) which, in turn, was loosely based native American folk tales, including a legend about a native American leader called Hiawatha. Disney's cartoon, however, told the misadventures of a native boy who was an inept hunter. Little Hiawatha appeared on the cover of Mickey Mouse Magazine v. 2 no. 12 (dated Sept. 1937) and, according to the inducks index, there was an obscure 'Little Hiawatha' comics serial published in a Disney comics magazine in Sweden in 1938, but his appearance in the American Silly Symphony newspaper strips was delayed until late 1940. 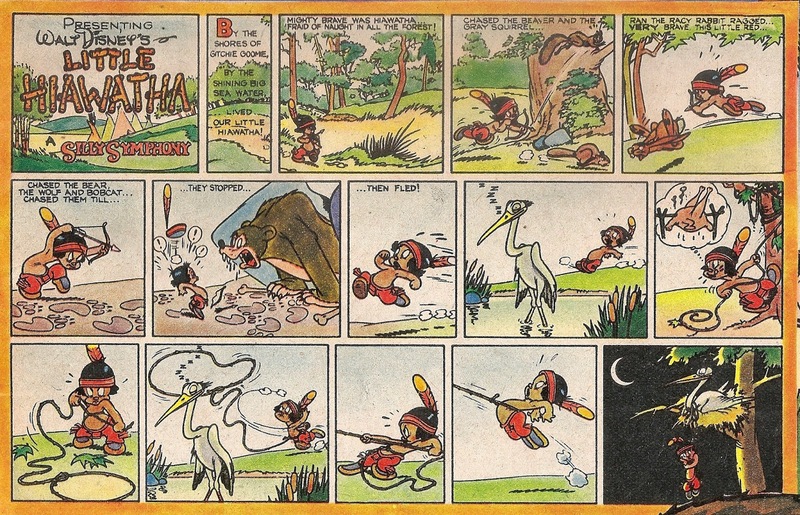 Early in 1941, Britain's Mickey Mouse Weekly began running a strip titled simply as 'Hiawatha' (rather than Little Hiawatha) at the top rim of its last pages. The scan above is of the earliest 'Hiawatha' strip in my MMW collection and it may very well be the first one (the scan is from no. 258 and no. 257 is missing from my MMW collection, but no. 256, which I have, doesn't have any Hiawatha strip). 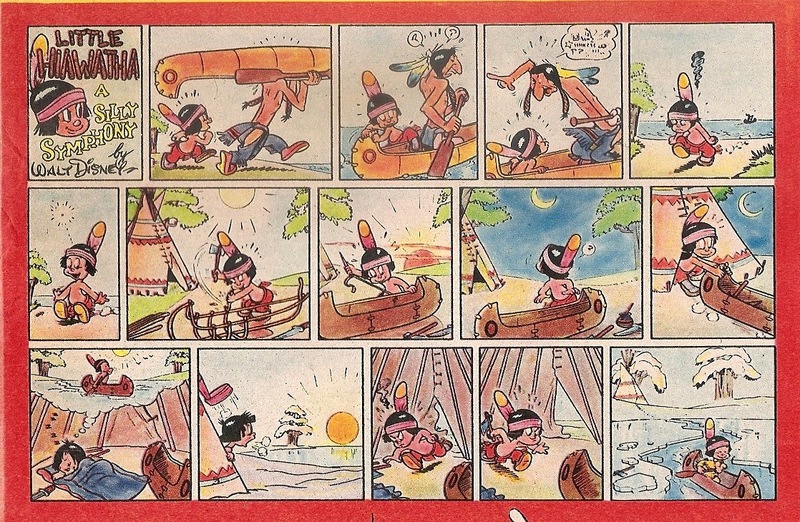 The artist of these apparently British-made Hiawatha strips is unknown, but a likely candidate is Ernest Richardson, who is the only known staff artist of MMW on board after his collagues were drafted in late 1940. Since my MMW collection is largely incomplete in the war-time era from 1941 onwards, I cannot say precisely when the British-made Hiawatha strips ended, but I can confirm that they did not last into 1942. The American 'Little Hiawatha' Sundays, on the other hand, would end in 1942, but Little Hiawatha would be revived in American Disney comics magazines early in the 1950s. Today, short Little Hiawatha comics are made by various European artists for the Dutch market. "GIVE ME SOME GAS AND MAKE IT SNAPPY!" HAPPY 80TH BIRTHDAY DONALD DUCK!